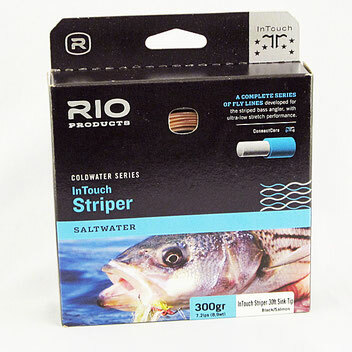 The Rio InTouch Striper 30 foot sink tip line is a versatile integrated shooting taper line that can be used in both saltwater and freshwater environs. With a 30’ fast sinking head, an extended 14’ intermediate sinking back taper and long thin running line, the InTouch Striper line is great for making those long distance casts and getting the fly down quickly. The line is available with head weights from 250 to 450 grains in 50 grain increments and is suitable for 7 through 11 weight rods. We have even used the 450 grain line on 12 weight rods in a pinch. The sink rate of the sinking portion ranges from 6 inches per second (IPS) for the 250 grain line to 9 IPS for the 450 grain version. The line has plenty of mass in the head to toss bulky and heavily weighted flies. The long back taper makes for an easy handling integrated shooting line that will cast well with a wide range of line lengths outside the tip top. Calico Bass taken while fishing with Rio InTouch Striper line. While this is our favorite line for fishing the Southern California surfzone, we also use it for fishing deeper areas of the bays and for both inshore and offshore saltwater fishing. 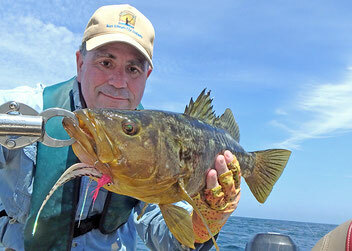 Calico bass, bonito, barracuda, yellowtail, dorado, and tunas can all be targeted with this line. Earlier this month a 400 grain striper line was one of the lines we used targeting skipjack tuna. Trying to get down to largemouth bass working school’s of shad 5 to 20 feet below the surface? This is a line for the job. Targeting smallmouth bass in the canals of the Imperial Valley? This line is a good choice. Going deep for Lake Trout in Northern Manitoba, chasing Walleye in Wisconsin, or targeting Cabrilla in the Sea of Cortez? This is a line to consider. 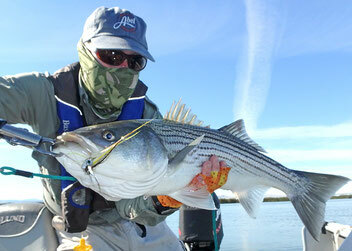 Since the product is called a “Striper” line, we even use it for striped bass on the Sacramento/San Joaquin River Delta and the lower Colorado River. Though this line is listed by Rio as cold water line, it works well in warm and even tropical conditions if a stripping bucket with a couple of inches of water in the bottom is used. Regardless of where you are angling, if your goal is to present a sizable or weighted fly at depths of 5 to 25 feet and you need to make long casts, The Rio InTouch Striper line will get your fly where you want it to be. Copyright 1999-2019 by Stroud Tackle.